Sources are saying that a lab technician who worked in the same building as Yale graduate student Annie Le is the main suspect in her murder. On Saturday, the body of Le, 24, was found inside a wall in the basement of the building where she worked; it was the day she was to be married. Police have classified her death as a homicide, and have said it was not "a random act," but have not released the cause of death. Several media outlets are reporting that the prime suspect is a technician in Le's lab, who has defensive wounds consistent with a struggle and failed a polygraph test. People also says that the lab tech asked for a lawyer after he stopped answering police questions. New Haven Police Department spokesman Joe Avery denied these reports, but the police have been very tight-lipped in this case — they won't officially speculate, for instance, on the owner of bloody clothes found hidden above ceiling tiles in the lab, which are not clothes Le was wearing when she disappeared. One source says they may belong to the killer. Whether or not the lab tech is in fact a suspect, there are a limited number of people who could have committed the crime. Yale President Richard Levin said, "We know everyone that was in the basement. There were limited number of people in the basement and we passed that on to police." Professor Gary Rudnick, who had interviewed Le for admission to her graduate program, confirmed that only certain people had access to the building where she was found, and even fewer had access to the basement. A retired police officer who spoke with The Daily Beast also pointed out that the killer would have had to know the building well in order to hide Le's body and the clothes where he (or she) did. The Yale campus is now on high alert — Prof. Rudnick says there may be a "murderer among us." Yale Daily News editor-in-chief Thomas Kaplan says, "Only Yalies had access to that basement, and that seems to point to someone in our community being involved in this. That's what is so frightening." The New York Daily News points out that although police have said no one at Yale is in danger, "the killer is still at large and had access to the secure building." Yale has apologized for sending an e-mail to students advertising a job-search workshop called "Killer Cover Letters" — although the workshop's title had apparently been used before, Yale College assistant dean Philip Jones acknowledged that this was probably not the time to be calling anything "killer." 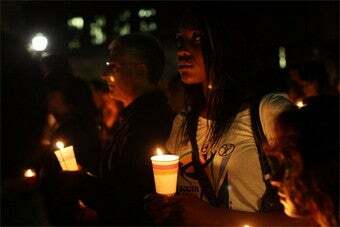 Students held a candlelight vigil Monday night in memory of Le. According to her roommate Natalie Powers, Le "was kind, generous, sharing ... the list just goes on. Annie was also tougher then you would think by just looking at her." And Yale chaplain Sharon Kugler said, "No day, no season, will ever be the same for us now that Annie Le has left this Earth."